These scholarships are designed for students willing to pursue all or part of their university studies in France in higher educational institutions authorized to deliver national diplomas. The concerned courses cover only the academic year equivalent to a first or second year of Master’s degree or leading to a national diploma of an equivalent level, according to diplomas delivered by the French host institutions. To be enrolled or about to enroll for the start of the next academic year in one of the required education levels. Scholarships will be granted for the duration of the academic year of the candidate’s formation. Scholarships granted by the French government are equivalent to a monthly maintenance allowance of about 700€ paid directly to the scholarship holder. It is aimed at covering accommodation expenses and common costs. Every scholarship holder benefits from a social security coverage as well as tariff advantages linked to their status (including university housing opportunities). The scholarship’s vocation is not to cover all or part of of the tuition fees, it can only be attributed to applicants enrolled in a higher education institution that is not requiring any tuition fees for the aimed courses. French Government Scholarships cannot be combined with scholarships from other french Ministry, or with an Erasmus + grant. a letter from the Estonian employer for the professionally active applicants allowing a study leave. The letter from the Estonian employer for professionally active applicants and the certificate of pre-registration can be provided after the application has been submitted. At the same time, the applicant will start the necessary process to obtain a certificate of pre-registration of the higher education institution they wish to attend. 2. First selection will be made after reception of all applications. 3. Interviews for the final selection will be organized starting April 29th 2019. 4. Applicants will be informed of the final decision on May 13th 2019. 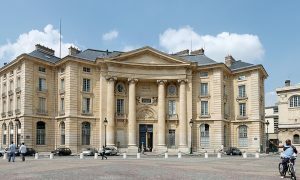 The application will only be validated after receiving the certificate of registration or pre-registration in a French higher education institution. For more information, contact the Campus France office in Tallinn mathilde(at)ife.ee.